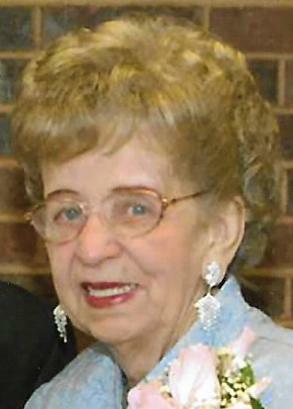 SHEFFIELD – Eloise I. Currier, 93, of Sheffield, died at 12:48 p.m., Tuesday, February 5, 2019 at the Kewanee Care Home. Funeral services will be held at 10:00 a.m., Friday, February 15 at Rux Funeral Home in Kewanee. Her son, Bill Currier will officiate. Visitation will be held from 5:00-7:00 p.m., Thursday, February 14 at the funeral home. Burial will be in Fairview Cemetery in rural Annawan. Memorials may be directed to the Fairview United Methodist Church, Church of Peace or to the Church of Jesus Christ of Latter-Day Saints. She was born November 6, 1925 in Neponset Twp., IL, the daughter of George W. and Ethel (Adams) Harvey. She married William J. “Bill” Currier on December 6, 1946 in Kewanee and he preceded her in death on January 25, 1989. Survivors include her three sons; Ronald (Pamela) Currier and William “Bill” (Rita) Currier, both of Neponset and Stephen (Iris) Currier of Sheffield, two sisters, Anna Mae Sapp of Kewanee and Verna (Anthony) Codo of Youngsville, NC, seven grandchildren; Chadd (Liane) Currier of Olathe, KS, Heather (Rob) Currier-Cullinan of Tampa, FL, Kristen (Curtis) Balfour of Neponset, David Currier of Annawan, Keri (Andrew) Benning of Morton, IL, Matthew Currier of Sheffield and Jennifer (Daniel) Bartolazzi of Springfield, IL, great grandchildren, Hillary and Ava Currier, both of Olathe, KS, Elizabeth, Nolan, Addison and Emily Bartolazzi, all of Springfield and Abigail Balfour of Neponset and several nieces and nephews. She was also preceded in death by her parents, a brother and sister-in-law, Warren (Ruth) Harvey, a brother-in-law, Dan Sapp and a great granddaughter, Norah Benning. Eloise graduated from Neponset High School in 1943. Following high school, she had worked at Boss Manufacturing, Walworth and had also worked at G.E. in Morrison, Super 8 Motel in Kewanee for 13 years, the Henry County Senior Citizens Center and as a teller and file clerk at Peoples National Bank for 29 years until her retirement. She was affiliated with the Church of Peace in rural Kewanee. She enjoyed collecting dolls, traveling, watching football, playing cards, taking pictures, shopping at Goodwill and the Salvation Army, writing poems, riding on combines picking corn, riding ATV’s, embroidering and crocheting. She also enjoyed visiting with friends and eating at McDonalds. Most of all, Eloise enjoyed family gatherings at reunions, Easter, Thanksgiving and Christmas and just being with her family, especially her grandchildren and great grandchildren.